This is freaking amazing. I was checking out some message boards last night at the Folding Forums at Stanford, a group that tracks the Folding at Home application. 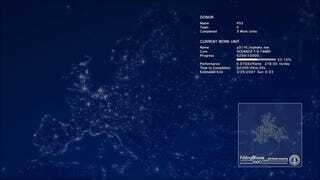 You know, that's the software that runs on Sony PS3 or PS2 gaming consoles, all linking up over the Internet and using their spare cycles to help the university process vast amounts of Alzheimers research data? 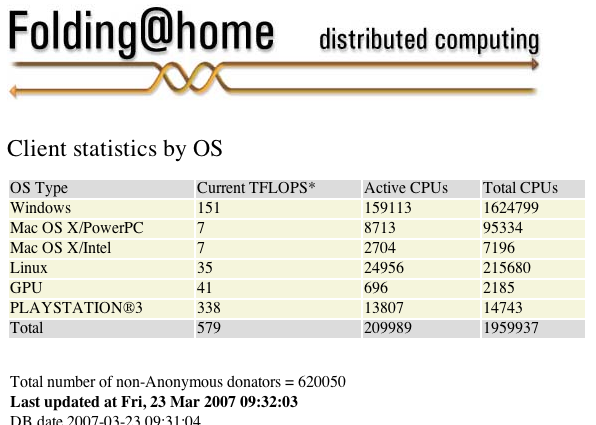 To my astonishment, I discovered that a small legion of 13,000 PS3s running the Folding at Home app account for most of the computing power in the project, amounting to about 56 percent (PS3s = 316 measured TFLOPS) of the total. The project just needs about 18,000 more PS3s participating to make the Folding at Home project the first distributed computing project to hit a Petaflop. To put that into perspective, the Japanese MDGRAPE-3, RIKEN's supercomputer, has about a Petaflop of computing power. And the potential goes on from there. There are 2 million PS3s in the wild, and over 100 million PS2s shipped thus far. PS3 owners, what are you waiting for? Get the word out to other PS3 owners. Let's help cure Alzheimer's disease. P.S. I'm sure there are CS majors out there who can fact-check this post. Post your updates in the comments.